Comparing the flow of information in a functional and a dysfunctional organization can best be illustrated by thinking of an hourglass. An hourglass is a device that measures time by the flow of sand between the upper and lower chambers. A narrow opening between the upper and lower chambers controls the flow. Imagine the hourglass as your organization, with the sand representing information flowing from the upper level into the lower level. What would happen if the information flow were inverted? In other words, what is the potential for information sharing? When the hourglass is standing upright information flows freely between the upper and lower chambers then you are in a functional organization that values planning. If, however, the hourglass is lying on its side information settles at either end, then your organization is probably dysfunctional. The people at either end know what they know, but there is no flow between them. Planning, if there is any, is conducted independently in isolation. The middle level of a functional organization is always under pressure as the information comes down from above and then rebounds from below. The good news for Doers in a functional setting is that even if the information flows under pressure, they can count on it to contain realistic time lines, reasonable goals, established priorities, measurable expectations, and a clear direction to follow. Frustration derived from the lack of information flow is usually very high in a dysfunctional organization. Upper level pressure moves downward in the form of directives, deadlines, and disciplinary action. Pressure from the lower chamber floats upward in the form of complaints, challenges, and concerns. 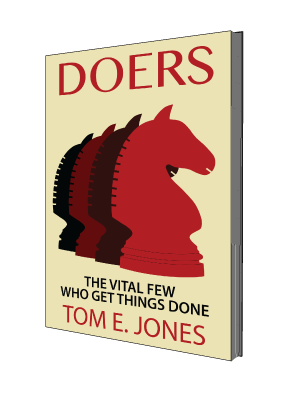 In general, Doers in the middle of the hourglass know very little, but are expected to do a lot, which is one of the reasons they suffer. A few years back there was a big push to better manage time. Management seminars and books promoted the idea that if you tried harder you could manage your time better. Most people attending the seminars were sent there by a boss who, according to the participants, was the one who was wasting their time. It was not long before the participants could see a connection between the inefficient use of time and their incompetent boss. As time management technologies were adapted, Doer efficiency increased. Unfortunately, the technology had the opposite effect on management. The implementation of these innovations uncovered their lack of planning skills and their inability to cope with shorter time frames and multiple priorities. As consumer scrutiny, economic uncertainty, and technological advances continue, upper level management is finding it increasingly more difficult to keep up. To overcome this deficiency in your work setting, you should consider taking on the responsibility for moving an idea through the stages of planning, research, development, production, and distribution.